The majority of passenger cars do not have an AC outlet but with the use of a power inverter for a car, you can convert the standard 12V from the cigarette lighter into a range of other voltages such as 110V, 120V, 220V, 230V, 240V and more. The best power inverter for cars is the KRIËGER 1500 Watt 12V Power Inverter, which has a dual 110V AC outlet and is MET approved according to UL and CSA. Using a car power inverter, you are able to power up anything from a TV to a laptop with great ease. The power inverter simply plugs into your cars cigarette lighter or alternatively straight to your cars battery. Using a power inverter for your car can come in great use for long journeys and powering up gadgets. For example, if you have headrest DVD player for your back seat passengers, you are able to plug the wires straight into the power inverter. Compared to the home power inverter, the car alternative looks fairly different but provide the same functionality of converting the power source from direct current to alternating current. There is a wide variety of power inverters available but in most cases, you will not need one with an output of over 1,000 watts. The 12V outlet in most vehicles has only enough power for certain gadgets but this is where the power inverter benefits become clear. 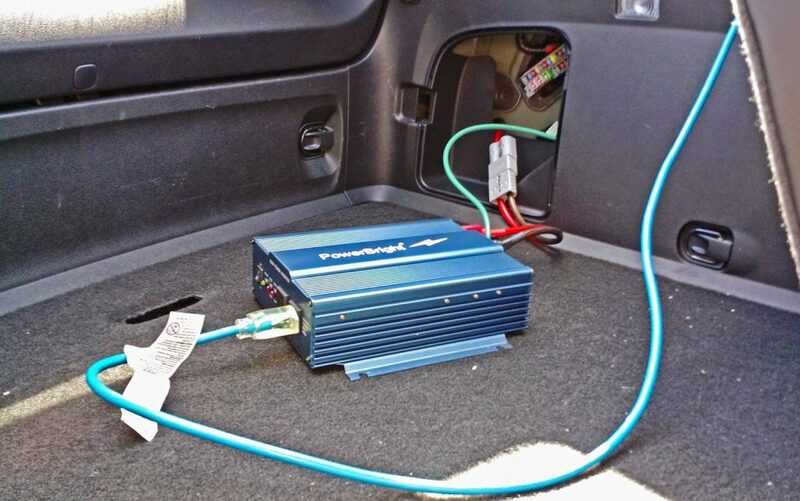 Below is a list of the best power inverter for cars that will power up all your gadgets for a long journey. The KRIËGER is a dual AC outlet power inverter for cars that converts 12V DC to 120 AC power. This particular package comes with a complete installation kit with a wired remote control, ANL fuse kit and 3 feet of battery cables. KRIËGER is pure sine wave power inverter that connects directly to your car battery for power constantly without the need of plugging it into the cigarette lighter. In terms of the safety of this car power inverter, it uses an overload, temperature, short circuit and other protection methods. Realtime feedback is also displayed on the LCD display along with the input voltage, output voltage and battery level. It is also validated and approved by METLAD under UL std 458 and CSA std C22.2. Overall, it is the best power inverter for cars that comes with a 3 year parts and warranty labor for peace of mind. KRIËGER also provide this model of power inverter in 1,100, 2,000, 3,000 and 4,000 wattages with each increasing in price. For those that are after as much wattage and features possible, the Energizer offers exactly that. As with the KRIËGER alternative above, the Energizer is available with wattage outputs that include 100, 500, 1,100, 1,500, 2,000, 3,000 and 4,000 wattages. It is a modified pure sine wave car power inverter that converts 12V DC to 120V AC power. It connects directly to the cars battery and the power is ready to use. The Energizer is also MET approved under UL std 458 and CSA std C22.2 and includes a wide range of safety features from overload to short circuit protection. Overall, it is a high performing power inverter for cars that provides all the power and features that you could ever need. Compared with the KRIËGER, it is slightly more expensive and doesn’t include the installation hardware. Power Bright is another manufacturer of many different types of power inverters with a variety of wattage outputs. The APS600-12 model is a heavy duty power inverter with a built-in thermo cooling fan and anodized aluminum casing for durability. In terms of its performance, it is able to provide 600 watts of continuous power with a maximum output of 1,000 watts at peak power. Power Bright claim that their pure sine wave power inverters provide a premium power that is identical or even better than what is supplied by electric companies themselves. It plugs straight into a 12 volt DC battery and provides reliable power for running laptops, television and other electrical gadgets that need high and reliable power. Overall, it is the most durable power inverter you can buy with high quality materials and excellent cooling to protect the internals from overheating. Bestek is another big brand in the electrical gadget industry with many cigarette lighter splitters and other devices being very popular worldwide. 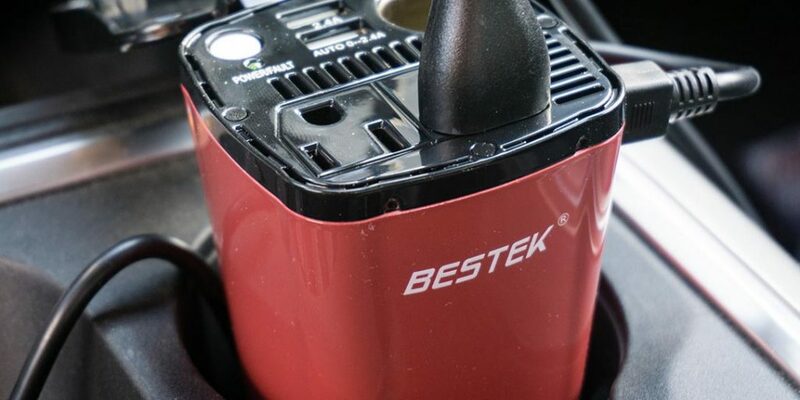 The BESTEK power inverter provides 400 watts of continuous DC to AC power and a large 1,000 watts at peak power. In terms of the features, it provides a dual 110V outlet for powering up the majority of domestic gadgets from refrigerators to laptops. There is even a 4 port USB charging port for powering USB devices such as iOS/Android chargers. There are replaceable fuses and a cooling fan as well as over voltage, over current, under voltage, short circuit protection and more. Connection to a DC power source can be achieved via a 2.3 feet cigarette lighter plug or 2 feet battery clips. Overall, it is the best car power inverter for the money with the addition of the cigarette lighter and USB ports. The Foval is by far the most popular power inverter because its the cheapest available with both an AC outlet and dual USB port. Unlike the other alternatives in a similar price bracket, the Foval has a better build quality and comes with 18 months warranty for peace of mind. It is a small car power inverter at just 3.2 x 2.5 x 1.5 inches in size but still includes all the safety features found in the more expensive alternative above. For such a cheap power inverter, its fairly impressive that the Foval uses a solid metal housing and includes a silent cooling fan to reduce heat. Overall, it is the best cheap power inverter for cars with all the power and safety features you need. The car power inverter plays the role of converting direct current from the car’s battery and electrical systems to alternating current which can be used by electric appliances. It is contrary to converters which change alternating current to direct current, but both operate within a specific voltage range and not a particular set voltage, with both often known as chargers or adapters. Most electrical appliances use alternating current (AC) therefore electrical systems in businesses and houses supply alternating current as well. Automakers though have not yet installed internal inverters which would provide alternating current from the vehicle’s battery and electrical system, thereby necessitating the need of an external converter to charge electrical gadgets. The inverter is mostly plugged into the car’s cigarette lighter socket, but high voltage inverters are connected directly to the vehicle’s battery. The converters find use mostly to provide power for heating devices, small refrigerators, and entertainment equipment. Furthermore, in cases of power outages, the inverter comes in handy by supplying power to house devices and appliances in the house by using a long extension cord from the car. An inventor’s power is measured in watts, and it should be able to supply the surge power and the typical power. The surge power is the highest power an inverter can produce usually lasting less than a couple of minutes. Some appliances, such as refrigerators, compressors, and pumps require high surge power to startup than they need to run. Thus the watts in use can be twice the amount used when the device uses when running usually. Since typical power is lower than surge power, when deciding the best car power inverter, one should buy an inverter able to meet the surge load and the typical continuous current for all of the devices one has. Inverters can either have a single outlet or multiple outlets. Single power outlets are cheap and simple to use, providing continuous current ranging between 150W and 200W. It is most commonly used where an individual has only one device to charge, connected through the cigarette lighter of one’s vehicle. On the other hand, multiple outlets are bigger and bulkier with the ability to provide a higher amount of continuous current in comparison to single outlets. These ports are there for fast charging digital devices such as tablets and smartphones through a USB cable. Amount of power doesn’t vary whether one is using a standard outlet or a USB outlet, but the USB outlet not able to power a lot of appliances. This system protects the car battery and inverter unit in case the inverter overheats and is draining the car’s battery. Therefore, whenever the safety shut-off senses an overload, it automatically shuts down the inverter before it completely drains off the car’s battery. Outdoor recreational activities such as stargazing, camping, and sports tailgating need inverters. Air conditioners, heaters, kitchen equipment and refrigerators which are in use during such times need power thus an inverter comes in handy during such activities. In case one finds themselves in a location outside electrical power supply or experience power outage, a car power inverter can be used to power a variety of appliances. It includes pumps, saws, and welders, and a good example is using a hacksaw to cut down trees. The hacksaw draws its power from the car power inverter connected directly to the battery, thereby able to undertake the tree felling efficiently unlike using an ax. Entertainment is vital especially when taking long trips to avoid boredom. Thereby, the car power inverter comes in handy during such times, especially true with many older model vehicles not well-equipped with entertainment devices such as DVD player. Therefore, having an inverter connected through the cigarette lighter socket, multimedia devices such as laptops, DVD players, and gaming consoles can be powered as they don’t need a lot of watts to necessitate direct connection to the car’s battery. Therefore, individuals get to enjoy their journey. While on the road, mobile phones, tablets, laptops and other portable devices often run out of charge. During such moments, an inverter comes in handy. Since this devices require a little amount of watts to charge, the inverter is connected through the cigarette lighter socket and can power up the machines. Moreover, owning an inverter with a high range of equipment powering ability is ideal to a maximum of 160 watts in total is a wise decision and has three of four plugs to connect more than one device at a time. Placing the inverter in a relatively flat surface whenever it is in use. The inverter should never be placed in proximity to flammable substances. The inverter should always be kept dry, and any device connected to the inverter too should be dry as well. In case either of the two is wet, don’t operate the inverter. The inverter’s ideal temperature is between 50 degrees to 80 degrees. Therefore, at no point should the inverter be subjected to direct sunlight. In cases where the inverter’s installation is permanent, it should be outside of the engine compartment. It is because of the dangerous and toxic gasoline fumes produced by the engine as well as the sparks inverters produce. Furthermore, due to the excessive heat under the hood, the inverter should not be fitted in the engine compartment. The battery cables also should also go through a surface that is dry and comparatively cool to the location the inverter is mounted. Finally, the inverter should always be well ventilated whenever it is in use, by keeping a few inches on top and bottom side. It allows for proper ventilation and cooling of the inverter. Using a power inverter that connects to your cigarette lighter or directly to your battery has numerous benefits. Being able to plug AC powered gadgets into the inverter is highly desirable and great for long road trips and more. Choosing between our recommendations is dependent upon your own personal budget and the amount of power that you require. Of course, if you are using other cigarette lighter gadgets such as a Bluetooth FM transmitter, you may want to opt for a battery connection for your car power inverter.